The government is to proceed with plans to scrap academic selection in grammar schools in Northern Ireland, the education minister has said. Barry Gardiner was responding to a newspaper advert paid for by former grammar school pupils opposed to the recommendations of the Costello Group. The Confederation of Grammar Schools' Former Pupils' Association was set up to lobby for the retention of academic selection and other related issues, after it was announced in January that the 11-plus would be scrapped. 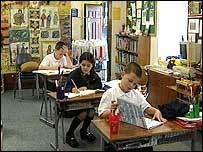 The government decided to abolish the tests in 2008, following consideration of the Costello Group's report. The government-appointed working body was set up to suggest alternatives to the current transfer tests. Mr Gardiner said on Monday that there was no alternative to the 11-plus and it was educationally unsound to segregate children at the age of 11. On the issue of whether grammar schools could keep their academic reputations, without the 11-plus or some other academic selection, the minister said many were already taking in a wide range of abilities. He said there was a rising proportion of children in grammar schools with C or D grades - 80% take at least some pupils with the lower grades. Mr Gardiner said more research on admission trends would be ready by the end of the year. He accused some in grammar schools of being keen "to talk up the need to maintain an academic ethos" while "in reality... they were happy to admit grade C and D pupils and take the resources that came with them". Mr Gardiner has denied that the Costello recommendations will be responsible for school closures and said that was already on the cards because of falling school numbers. Two meetings of MPs in Westminster last week also questioned the minister and Department of Education officials on the planned changes to the education system. Ulster Unionist and DUP politicians added their voices to protests about the planned abolition of academic selection. David Trimble called on the minister to reject the report, but the Northern Ireland Teachers' Council has called on the government to speed up preparations for change. The council says it is disappointed that a number of grammar school heads have "turned their faces against Costello". It says many issues needed to be addressed but people needed to look to the future and not the past.